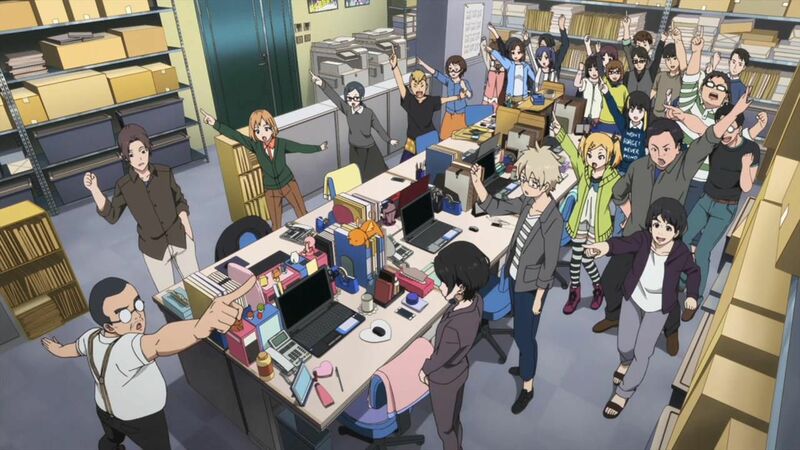 One of the big hits of recent anime seasons has been Shirobako (literally ‘White Box’), a show that shoe-horns an off-the-peg cast of perky graduates like refugees from K-On into the heady world of anime production. Shirobako is a workplace drama, but also a knowing parody of life in the anime industry, often with recognisable caricatures of well-known figures, and depictions, just the right side of actionable, of notorious incidents from business legend. Shirobako successfully conveys the awful daily grind of working on Japanese animation. Entire scenes crawl past of people in messy, cluttered offices shouting each other about file numbers and storyboard pages, and losing the plot about frame counts. Despite occasional cutaways to the flights of fantasy they are working on, life in the fictional “Musashino Animation” company is largely seen to be a dull and stressful slog, with little obvious reward. Ironically, in the real world, she’d be the one on the highest wages. A study published by the Japan Animation Creators Association (JaniCA) claimed that the mean entry-level salary for new animators is (and has been since at least 2009) just £6,000 a year, with an average working day of 11 hours. Inbetweeners in Japan are competing directly with Chinese labourers who are submitting comparable work across the internet from a place with lower costs of living. If they don’t prove themselves worthwhile, they remain stuck on paupers’ wages, which have not gone up in five years. Put another way, the people who make your favourite anime can start on salaries as low as 65p an hour. One wonders how the real-world versions of the breathless, gamine girls in Shirobako would come across if they couldn’t afford soap powder or, well, soap. It’s difficult to imagine these conditions lasting for much longer before there simply aren’t any Japanese animators in Japanese animation. Which means more producers and directors coming in sideways from other professions, not up through the ranks, and commanding a staff in a foreign country through Skype and shouting. Has anime, which always was regarded as a cheap option in the first place, successfully priced itself out of its own market? Jonathan Clements is the author of Anime: A History (UK/US). This article first appeared in NEO #138, 2015.